Where are you from? Your profession? I live in Fern Park, Florida and have been a Florida resident for the past 23 years. I am originally from Puerto Rico. I’m a mental health counselor, with a specialty in infant mental health. I work as an independent contractor for Kinder Konsulting, an agency that focuses on young children. When and how did you become interested in paddling? I started paddling shortly after I arrived to Florida, but only day trips for the first few years. Then I began working at a substance abuse residential program for teenagers, which included experiential therapy as part of its curriculum. I took the kids to do different outdoor activities and events and helped them process their experiences. One of the trips involved a five-day kayak journey on the (northern) Withlacoochee River down to Suwannee River State Park. After that trip, I was hooked on kayaking. Where is your favorite place to paddle? It is hard to identify my favorite place to paddle. I have paddled in numerous states and Puerto Rico. All the paddles have their charms. I enjoy the wild ways of the Econlockhatchee River, and the clear waters of Juniper Springs are a marvel. My best paddles have definitely been here in Florida. What’s the most interesting thing that ever happened to you on a paddling trip? I had a very interesting event occur while on the (southern) Withlacoochee River. I took a hike after paddling, became lost in the woods, and ran into a hunter who proceeded to hunt and kill a bobcat while leading me back to camp. On another paddling trip I fell off a bicycle I had rented, broke my wrist, and had to be taken off Cayo Costa by boat to a hospital. Each of those occurrences could have been traumatic, but my fellow paddlers were always there to support me. They have been a blessing! 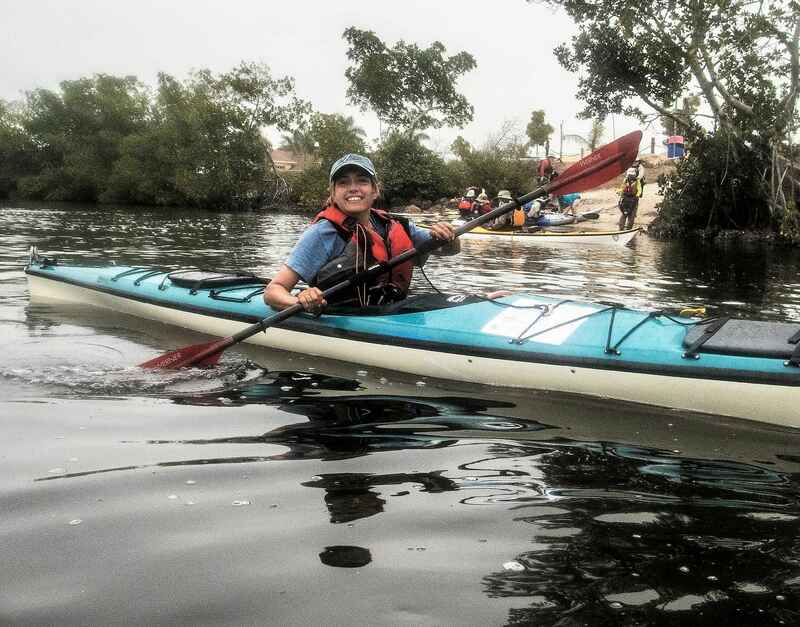 How did you hear about Paddle Florida and which trips have you gone on? I heard about Paddle Florida through the Internet. My husband and I were looking for a long kayak trip and just happened to stumble upon the website. I have been on the Wekiva/St. Johns, two separate Suwannee trips, the Withlacoochee, the Bartram history paddle on the St. Johns, the Keys, the Calusa Blueway twice, and the recent Ochlockonee River trip. Can you describe a Paddle Florida trip highlight? On my second Suwannee trip, there was one particular day when I was not feeling particularly well physically or emotionally. I had not slept well and had a bad stomach ache. That morning I paddled off a little ahead of the lead. The water level was unusually low and it was very foggy. Everything was quiet, tranquil. In front of me I could just barely make out the forms of deer right in the middle of the river. It brought such peace to my heart. I will never forget that morning. Paddling can bring such spiritual and healing strength. Experiences like that help me put into perspective what is really important in life. After that trip I came home with a determination to keep that peace of mind consistent in my life. What advice do you have for folks considering a Paddle Florida trip? For people giving Paddle Florida a try, I say make the most of it. The trips have been amazing and the staff more than helpful. The people who come are seeking the same kind of experiences you are, and the trips provide an opportunity to connect to others of like mind. I refer to them as my "paddle family." Who knows, maybe you’ll have your own spiritual awakening.